I'm not very good at explaining Jesus Christ, but this Heaven Booklet says it all. — L. W.
This little booklet is fantastic and such a comfort in time of grief. The first one I had was given to me at the time of my husband’s death. I used it like a daily devotional. It assured me of things about Heaven that I had never even thought about, even though I have been a Christian for years. 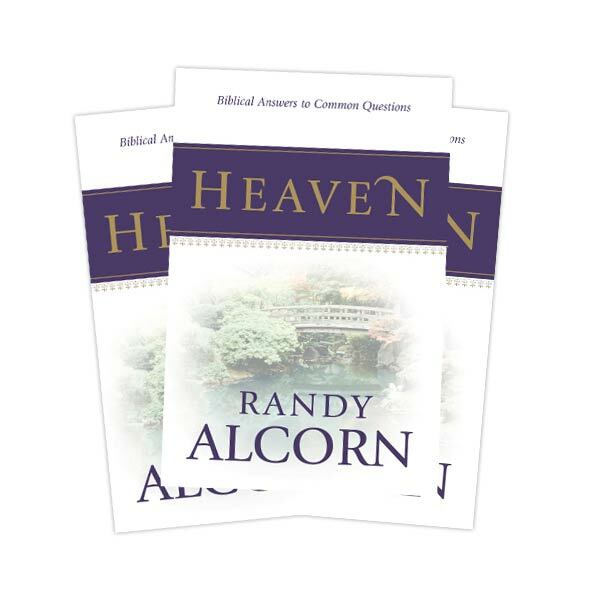 Randy Alcorn has done a lot of research on Heaven and backs up everything he says in the book with Scripture. I have also read Randy Alcorn’s comprehensive book Heaven, but I still go back to the little one for quick reference. I now am a leader for Griefshare in our church and I give this booklet to everyone who comes through the class. — R. F.
Five years ago I was given a copy of your Heaven Booklet. I had been a Christian for about 19 years, but I never had much enthusiasm about Heaven. One of my biggest issues was the fact that I wouldn't be married to my husband, whom I adore.The part in your book about marriage in Heaven was very comforting. When I read "Heaven is not a place of loss", I wept. I realized that loss was always at the heart of how I had seen Heaven. Having it addressed so clearly helped me realize that of course Heaven is not a place of loss. That would be the opposite of the point! I have looked forward to Heaven ever since. I long to be there where I will be whole and all be set right. —S. W.
I gave over 250 copies of this booklet away in memory of our mother at her funeral and visitation. What a wonderful evangelistic tool to put into the hands of those who came to pay their respects. — L. V.
The booklet versions of Heaven and If God Is Good have become standard usage for me when engaging in grief counseling with both those who are dying and those who have lost a loved one. While I occasionally give the full versions away the mini ones are so convenient - people who are grieving are intrigued by their titles and appreciate the shorter read during all of the business that dealing with a death can bring. Thank you so much for these books! Heaven revolutionized my thinking. — J. S.
This little booklet is a wonderful way to bring the message of Christ to others. No scare tactics, just truth and hope and encouragement. I bring a few with me during my daily walk and I give them to people I feel drawn to. If you find it difficult to speak openly about your faith, giving these little booklets to others may be the perfect way for you to help others discover the truth of Heaven and Christ. – V. S.
My husband was diagnosed with Multiple Systems Atrophy and a friend told me about your book Heaven. I read it to him a chapter, or sometimes just half a chapter, at a time. We were both amazed and overjoyed at what we learned, and we referred to it often. We also began to include the Heaven Booklets when we sent sympathy cards, and we gave out almost a hundred of them at his memorial service. — T. S.
We received your Heaven Booklet in a card that was given to us when our 15-year-old son passed away in January. I just wanted you to know that out of all the books we have been given, or that we have read, none of them have answered our questions like the book Heaven. I bought 3 copies of the full book to give to our son’s friends so they too could have that hope and understanding. I am going to get the bundle pack of the booklets to be able to give out to other bereaved parents as I come across them for the same reason. It has been the darkest hours of our lives and if I can help another parent maintain hope that Jesus gives us, it’s all worth it. — P. W.
Heaven: Biblical Answers to Common Questions is a 64-page small booklet and is awesome to share with people who you meet in the regular dailies of life. This is exactly what it was designed to do. I order these in the 20-pack so that I always have a couple in my purse to give away. People love receiving them and it’s so nice to be able to share such encouragement. — V. B.
I would like to thank you for the Heaven Booklet. It is wonderful! The gospel is clearly presented beginning on page 54. I am so thankful to have a non-intimidating booklet to pass out to shop keepers who work for long hours alone and would be glad to have something to read. — N. R.
A friend of mine is a missionary consultant. He is a wonderful behind-the-scenes person whom I really appreciate. He was telling me how effective he found your Heaven booklet and how he has used it to share with others. His wife has a unique ministry with models and it was helpful for one of them. — R. S.
Learn more about and purchase the booklet Heaven: Biblical Answers to Common Questions.